Jakarta, October 31st 2016 – favehotels, Archipelago International’s distinctive portfolio is proud to welcome two more properties to its portfolio. favehotels’ portfolio consists of 47 hotels nationwide, bringing the brand even closer to welcoming its 50th property. 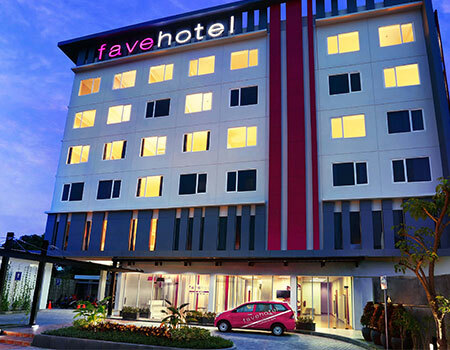 The recently opened hotels include favehotel Rungkut – Surabaya and favehotel Sudirman – Bojonegoro in East Java. 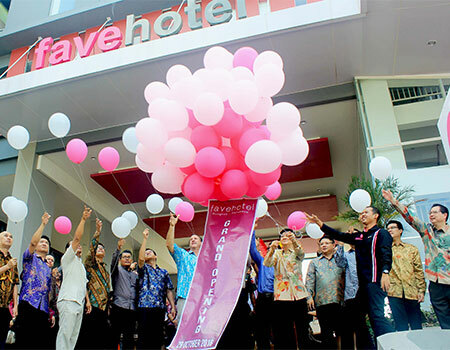 Launched in 2009, favehotel is a pioneer in the smart and budget hotel space and has grown exponentially from less than five hotels to almost 50 hotels. Inexpensive, fresh, attractive, contemporary and simple are the attributes that make favehotels so surprisingly different and destined to become the favorite choice for smart, budget-minded travelers. The smart design and clever use of space in the hotel's 100 to 250 guest rooms will be aimed at encouraging guest productivity while facilitating relaxation. In designing favehotels we have strived to avoid the "cookie cutter approach" to budget class branded hotels. Several different versions of the interior and facade designs are presented to hotel developers and they are strongly encouraged to adopt one in its entirety according to cost, location and customer profile. “favehotel is expanding nationwide at a rapid pace and we’re thrilled to introduce this brand to Rungkut – Surabaya and Bojonegoro. Our close proximity to important landmarks and modern facilities make this hotel become the ideal choice for business travelers and vacationers who want easy access to commerce, culture and recreation,” said Yohanes Sulistiyono Hadi as Regional General Manager of Archipelago International for the Central Region. Situated off Surabaya Rungkut Industrial Estate (SIER), the new favehotel Rungkut in East Java lends itself as a base for business travelers and tourists alike, conveniently located just 15 minutes from Juanda International Airport. The 173 guest rooms feature modern and functional offering cutting-edge LED televisions, complimentary Wi-Fi, laundry service, swimming pool, in room safes and comfortable bedding. The en-suite bathrooms come equipped with shower and modern bath amenities. Complimentary Wi-Fi is available throughout the property. The refreshing lobby concept is contemporary, open and stylish, with colorful, bright and welcoming spaces where guests can check e-mail, gather informally with colleagues or simply relax. To meet the needs of business travelers, the hotel also includes ten modern meeting rooms, an all-day coffee shop serving a wide variety of international and local cuisine, and spacious parking space. favehotel Rungkut’s choice location near government offices and local businesses makes it an ideal stop for business travelers. Its close proximity to the city centre and a number of local tourist attractions such as Surabaya Zoo, Taman Bungkul, House of Sampoerna, Galaxy Mall, and Suramadu Bridge equally well-suited for leisure travelers. favehotel Sudirman – Bojonegoro enjoys a perfect location in the center of Bojonegoro, just 15 minutes from Bojonegoro Railway Station and the Rajekwesi Bus Terminal. Government offices and the banking districts are within the hotel's direct vicinity, whilst nearby thoroughfares provide guests with easy access to the oil fields. Providing modern amenities and professional services that both business and leisure travelers will appreciate, favehotel Sudirman – Bojonegoro presents 115 super clean and stylish rooms that come with a choice of double or twin beds with top quality bedding, LED TVs with international & local channels and en-suite bathrooms with showers. Other hotel conveniences include a laundry service, parking spaces and in-room massages. Keeping business travelers connected, the hotel also features fast, reliable and complimentary WiFi throughout the entire hotel, as well as two meeting rooms to ensure a pleasant and productive stay. The hotel’s signature restaurant, Tastee Bites, then serves up hearty cuisine for a casual and enjoyable alternative to a formal lunch meeting. Bojonegoro is located along the banks of the Bengawan Solo river, the largest river in Java. The area is currently thriving with both culture and a booming business industry thanks to the biggest oil and gas discovery in Indonesia in the past decade and one of the biggest reserves in Indonesia. Bojonegoro also serves as the gateway to nearby tourism hotspots, like Kayangan Api, Pacal Reservoir and Wana Tirta Dander.